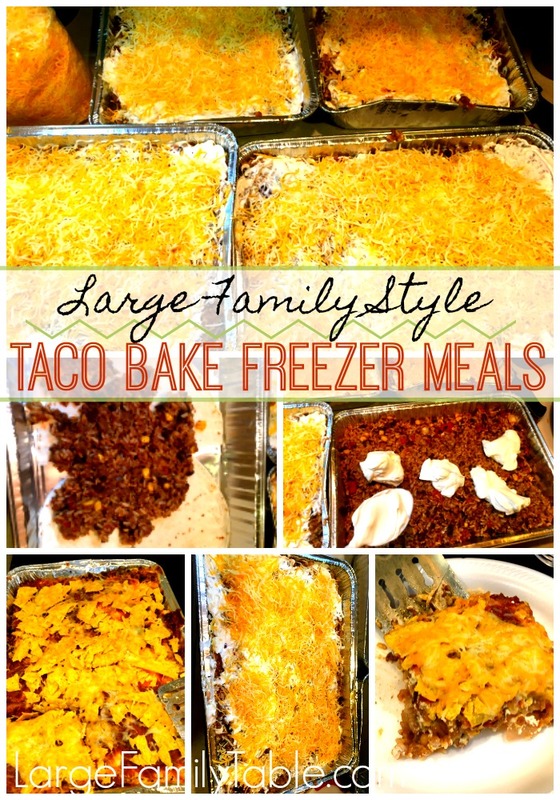 TACO BAKE FREEZER MEAL RECIPE FOR LARGE FAMILIES! 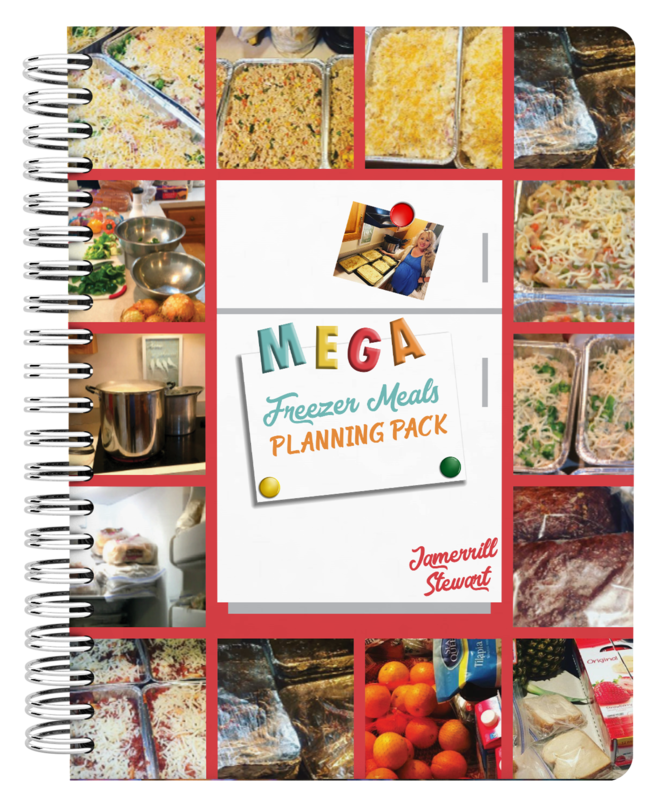 Don’t forget to grab the FREE MEGA FREEZER MEALS PLANNING PACK! I’ve created a free mega freezer meals planning pack to help you plan your next freezer cooking day! It’s 8 pages of freezer meal planning goodness!! Ok, so this is one of those recipes that I wish I had sitting on a plate in front of me now. 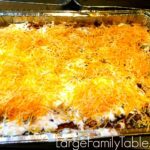 If your family loves Tacos, then they’re sure to love this Taco Bake with large families in mind! On my huge freezer cooking days in June, I made five large pans of Taco Bake. My plan was to layer taco shells throughout this Taco Bake. With my late pregnancy brain, I somehow didn’t have enough taco shells. I asked one of my best mom friend’s, Jo, who also makes an insanely delicious Mexican Lasagna (and it’s Gluten Free!) if she thought I’d be okay layering with tortillas. She gave me her seal of approval and man I’m so glad she did. Taco Bake always works well with layers of taco shells, but those layers of tortillas were a fun way to have these dinners, too! This recipe yields up to five 9×13 pans full of cheesy Taco Bake! 2 packets of pre-made taco seasoning or 3tbs chili powder, 3tbs onion powder, 3tsb cumin. **Taco Meat Mixture** Cook ground beef with onion or chosen additional veggies. Drain ground beef as necessary after fully cooked. Add premade taco seasoning or 3tbs chili powder, 3tbs onion powder, 3tsb cumin (or other favorite family spices) and mix within your cooked ground beef. Add canned corn, diced tomatoes, and black beans into your cooked ground beef as well. Lastly, add in 10 cups of cooked rice into your taco meat mixture. 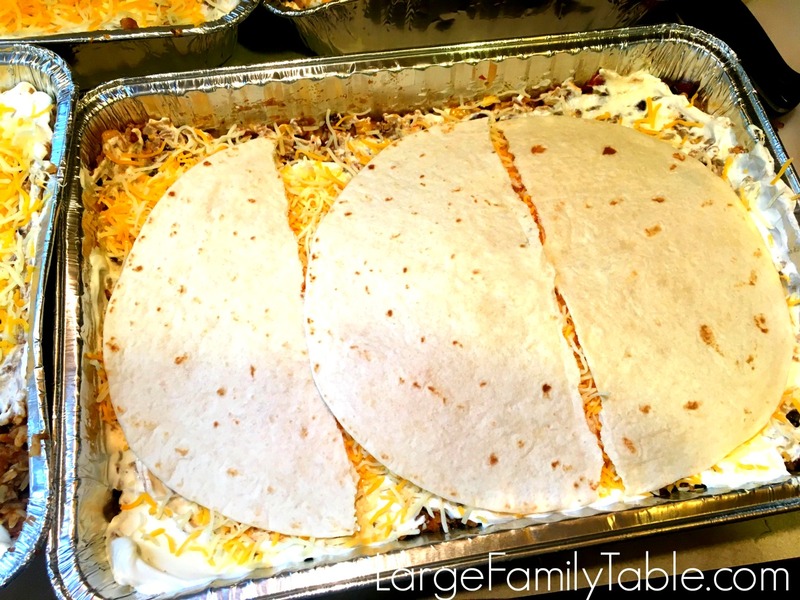 Line each 9×13 pan with crushed taco shells or tortilla chips (this is a great way to use up discount chips or stale taco shells). I lined each pan with extra black beans I had on hand. Then add a layer of the Taco Meat Mixture. Next, spread on a layer sour cream. After that sprinkle on a layer of shredded cheese, and next a layer of tortillas or broken shells. Repeat the layers until you near the top of your 9×13 baking pan. 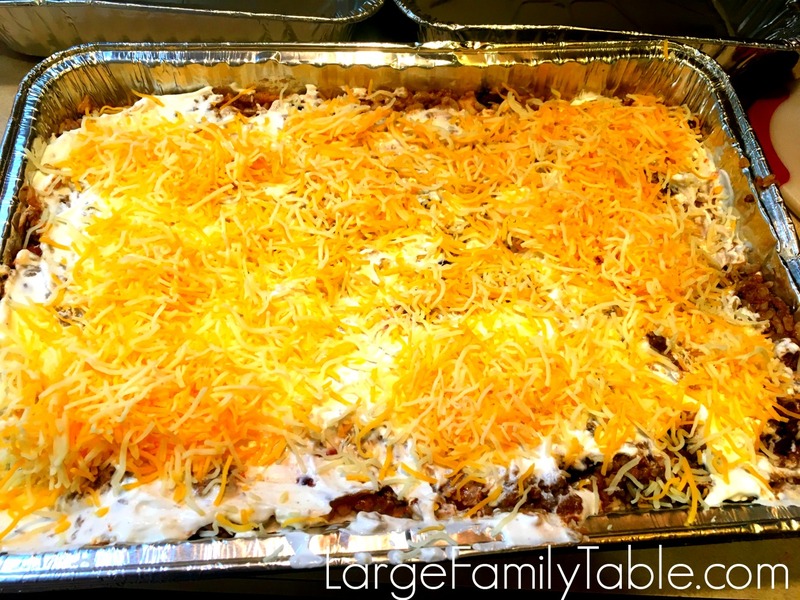 On baking day add a layer of fresh broken chips to top your Taco Bake! And repeat again! I was able to repeat my layers three times in each pan. Yours may vary. Set the desired pans of Taco Bake out in the refrigerator the evening before you’d like to serve them. Preheat your oven to 400 (oven times may vary). Place in preheated oven for 1 hour or until heated through and hot and bubbly. Feel free to add additional cheese on the day you serve this bake! 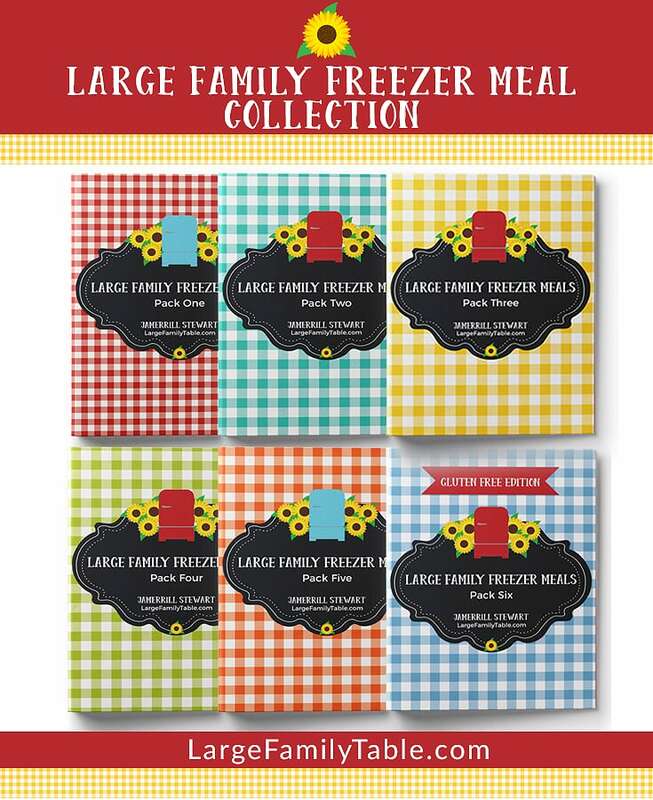 Don’t miss the recent 100+ Freezer Meals for Big Families including over 40 Large Family Style Dinner Meals! 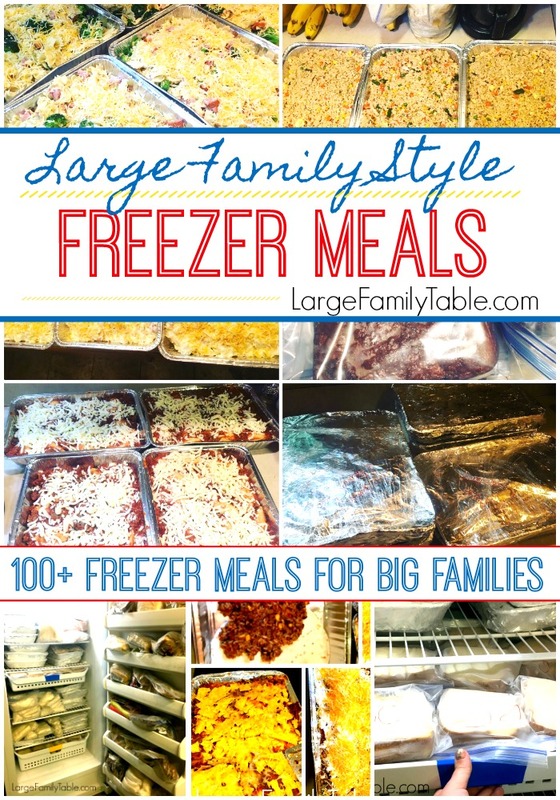 Click here for more large family freezer meals! I don’t like the texture of diced tomatoes so I would sub mild salsa that I had pureed in the food processor. that would add extra flavor. another comment. I notice you do not drain your beans when you make chili. why not? I find the liquid causes more bloating after you eat. Love your videos and your spirit. This sounds delicious! Doubtful with your large family that you’ve run into this problem but I figured it’s worth a shot to ask.. Do you know how the leftovers reheat? I’m worried about the texture of the crushed chips/shells when reheating for lunch the day after cooking. How long does the meals last in the freezer before you need to start using them? How many taco shells/tortilla chips should I buy? I plan on making this recipe for the first time this week. Have you ever cut the amount of ground beef in half and added refried beans to the mixture? Yes, that would work perfectly! !